Affordable Wedding Venue Redcliffe, Caboolture, Brisbane, Sunshine Coast. Budgets Under $5000 and Vintage weddings our specialty – Reids Place – Affordable Wedding Reception Venue based in Redcliffe, Brisbane, Scarborough, Caboolture, Sunshine Coast. Wedding budgets under $5000 are welcome! Exclusive Colonial garden wedding venue on the REDCLIFFE PENINSULA. Affordable Wedding packages for under $5000.00. When you hold your garden wedding ceremony at Reid’s Place you will have a whole lot more than just a beautiful garden as your ceremony venue! Close to Brisbane city, and northern suburbs. Beautiful old colonial home to use for your wedding preparation and photography. Garden chapel in the formal garden area for your ceremony. Award winning luxury Bed and Breakfast accommodation set in beautiful gardens. Located just 400 metres from the beach and foreshore of Scarborough. Close to local award winning restaurants and local Reception Venues on the Redcliffe Peninsula. Reid’s Place offers luxury bed & breakfast accommodation on the beautiful Redcliffe Peninsula. 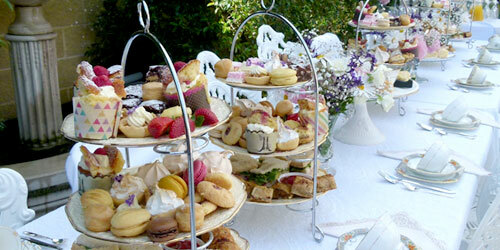 Treat yourself and your guests to an old fashioned elegant High Tea in our award winning gardens. It is now easier than ever to experience the taste of aristocratic society with antique fine china and crystal, with one of our High Tea banquets all homemade with love. Affordable Weddings – high tea – accommodation – bed and breakfast Redcliffe Brisbane. Wedding events, high tea, market day events and whats happening at Reids place Redcliffe Scarborough and around the area of Brisbane North.